This is one gaming moment I recall with vivid frustration. Almost as terrible as my experiences with E.T. for the Atari. The game itself wasn't so much the problem as a later level in the game. Anyone that was lucky enough to play this gem will likely have the same story of hitting a brick wall in the Mojo level. In the second to last level after the Mojo boss fight, one finds a computer screen to destroy. Then you are told to: "Reset the Computer." My friends and brothers spent an entire summer looking for a button. We scoured the level in the game to press and continue. The solution to this puzzle is quite the astonishment. Now years after attempting, failing and just moving on to other games, I happened to find the answer. This was years ago, by the way. 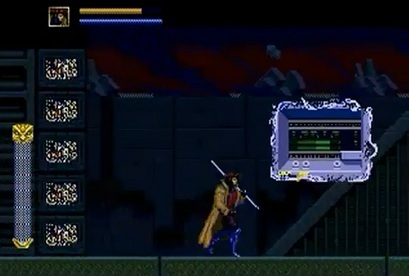 To reset the computer- the player had to press reset on the Sega Genesis console. Yes. I was taken aback. It felt like a slap in the face. Not only was the player supposed to think outside the game cartridge, but they were supposed to do something NO gamer in their right mind would ever think of doing for fear of losing progress in the game. And to top it off- if you pressed it for even a fraction of a second to long, the game would do exactly that- reset the system and you'd lose your progress. So gamers were supposed to tap the reset button which brought up a screen full of numbers and then moved you on to the next level. Absolutely brilliant for breaking the 4th wall for gamers, as well as being a horrible dilemma for kids that would never think of risking their gameplay by pressing the damn reset button. Are there ANY gamers out there that genuinely discovered the answer to this puzzle? Any brave kids that ventured to press the button that was typically off-limits to even think about touching? Anyway, while this game was an average game to play, I always wondered why they didn't just port the X-men 6-player arcade game that was released a year earlier. Either way the next X-men game to arrive on the Sega Genesis, X-men: The Clone Wars, was a vast improvement. Better gameplay, better animation, better story. It even gave players unlimited mutant powers! Not played this game, but it sounds like both a good idea and a bad idea at the same time, or at least a bad idea with good intentions. It's kind of cool that a game this old decided to "break the fourth wall" and have you do something in real life to affect the game (others did in a sense), but like you said they chose something that most gamers would be so afraid to do they wouldn't even consider it as an option. They get effort points for trying to combine the real world with the game world though. Oh it was absolutely genius- but something no young gamer would ever risk doing. I actually have a couple posts on deck about other games that contain mechanics and things like this one. X-Men 2 dropping you into the game without a title screen was great- If I remember right- each time you reset the game it randomly dropped a character in to start. Very neat idea.
" Are there ANY gamers out there that genuinely discovered the answer to this puzzle?" Surprisingly enough, yes I did. It was purely out of a moment of frustration, however. My younger brother did, out of frustration. Hit the reset button because he was so mad at it. Hahahah nice- must've gotten lucky on the quick press, just a tad too long and the whole game resets. Yes, I though of it playing Zelda for nes. I noticed that the data stayed in the system from the previous session after reset. So I figured maybe if this is true for Sega Genesis, then there was a vague possibility that resetting the game could be the answer. I was shocked and excited when it worked! That's a good thing to have picked up on. At the time this came out I would've never noticed such things- being like 12 or something and completely lacking awareness of how the game may have worked. Hahahaha No doubt- There was NO WAY I'd ever even think about touching the system's reset button. I got to that point hundreds of times. It became relatively easy. The stakes were very little in taking such a risk at that point. For me- even considering using the reset button meant having to start over from the begining. This is one of a few very memorable uses of system hardware that really made an impact on how I look at games now. Such a small thing really, make players think outside the box (or at least outside the game cartridge). I'm quite impressed by anyone that solved this brilliant puzzle. Well done to you for getting it, even now it stands as something most players wouldn't think to do. To this day, I can't think of any game that has implemented anything similar. Which makes me think that they were way ahead of their time. If they were to do something similar today, the internet would spoil the mystery for sure. During that time, not everyone had magazines or the same games. You were usually on your own. We Minnesotans have long and dark nights to fill with a lot of gaming. Holy Crap! I just grabbed X-Men NES cartridge and sure enough- the code is there on it! "+ B + UP together with START" Hahaha I never thought to look on the info portion for hidden codes! I've been considering playing this game again to finally beat it (17 years since I played it), but I've heard it doesn't work on the Sega Genesis 3, making the game unbeatable. Can anyone confirm? I think the problem with the SG3 is the same with emulators- they lack the "reset button" so you can't actually proceed at all. But if I recall correctly, you can play up to that point, quit, and then put in a level code to start at the next level. Not sure if that helps. I would also recommend playing X-Men 2: The Clone Wars for Sega Genesis- a far better game, as well as much more fun! Actually the Kega Fusion emulator has a soft reset feature. Thank you for the comment, I'll have to check out that emulator at some point to see if it works with this game. And apparently, some games that incorrectly used TAS instructions are unusable on SG3- (like Gargoyles) are unplayable for the system. No good. the moment i tested out this theory, that reseting the computer meant to reset the genesis, was the greatest moment of my young life. it meant that everything was possible. i wish i could go back and talk to myself to know where that idea came from, but it had to be a confluence of growing up in the 90s, not having access to the internet etc. Also, i had died so often, i was desperate to try anything. This, the passcode hidden in the physical letter in Star Tropics (for the NES), and (to a lesser extent) the code needed at the end of Resident Evil: Code Veronica are some of my favorite moments from my youth. One of my favorite games as a kid, after playing it probably a hundred times and being completely frustrated and anger to the end of mojo world, I decided to just play the game again to that point and hit reset, boy was I in for a BIG surprise. At first I thought my Genesis was broke but once the 1's and 0's cleared I was in for a big treat!! This was the first video game I ever owned but I could never get past this part. The worst part is I actually did try resetting the Genesis but I must have pressed it too hard because it actually did reset. I wasn't very good at the game so I couldn't even get to this part of the game without the invincibility Game Genie code. So for me, this game was so hard I couldn't even beat it while completely invincible. The only way I could beat it is with the Game Genie code to start on the level after Mojo's Crunch. Poor 10-year-old me.